For the filling, whisk 1 1/2 cups of the milk, the coconut cream, and sugar in a nonreactive saucepan and bring the mixture to a simmer over low heat. Meanwhile, whisk the remaining 1/2 cup milk with the cornstarch and egg yolks. Sprinkle the gelatin on the water in a small bowl and set it aside. When the milk mixture comes to a boil, whisk about a third of it into the yolk mixture. Return the remaining milk mixture to low heat and bring it back to a boil. When it starts to boil, begin whisking, then whisk in the yolk mixture. Continue whisking constantly until the cream thickens and returns to a boil, about 2 minutes. Off the heat, whisk in the softened gelatin and the vanilla. Press plastic wrap directly against the surface of the filling and refrigerate for 30 minutes, then continue cooling it at room temperature (if left in the refrigerator, it will set solid before the whipped cream is added). Once the filling has cooled, rewhip the cream if it has become liquid, then quickly fold it into the filling. Scrape the filling into the cooled piecrust, doming it slightly in the center. Chill the pie to completely set the filling. After an hour or so, cover the pie with plastic wrap if you’re not finishing it right away. 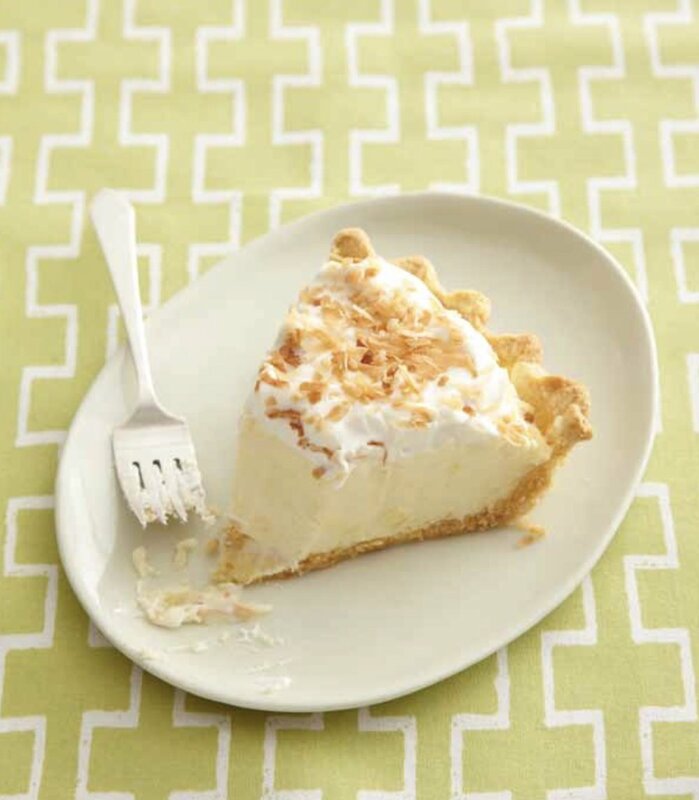 To finish the pie, whip the cream with the vanilla and sugar to a soft peak and spread it on the filling. Generously sprinkle the cream with the toasted coconut. Add the butter pieces and pulse again 3 or 4 times. Use a metal spatula to scrape the side of the bowl and mix the butter pieces throughout the flour. Using a fork, beat the eggs to break them up, and add them to the bowl. Pulse again until the dough almost forms a ball; avoid pulsing too much, or the pieces of butter needed to make the dough flaky will become too small. Invert the dough onto a lightly floured work surface and quickly press it together. Divide the dough into 2 pieces, form them into thick disks, and wrap each one in plastic. Chill the dough for a couple of hours before rolling. To blind bake, roll the dough and place in a pie pan. Chill while you preheat the oven to 350˚F. Line crust with parchment and dried beans or pie weights. Bake until the dough is set and no longer shiny and raw looking, about 15 minutes. Remove the paper and beans and bake until golden, about 15 additional minutes.